Beginning tomorrow (21st April), representatives from the Labour Party, the Conservative Party, the Liberal Democrats, the Green Party and UKIP will be answering questions from the public and hosts. 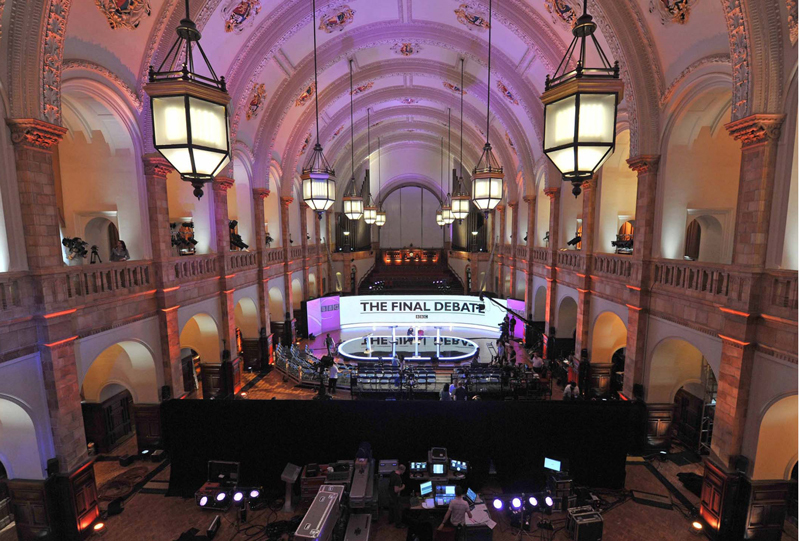 The Aston Webb’s Great Hall will first play host to BBC’s Newsbeat: The Election Debates on Tuesday 21st April, with the show being broadcast on BBC Radio 1, 1Xtra, BBC News Channel, and BBC Two. Candidates will respond to questions on the topics of the NHS, immigration and education. The topics were chosen after Newsbeat asked 6000 18-to-24 year-olds what the most important issues were to them as the election draw closer. The Great Hall also played host to one of the 2010 General Election Leaders’ Debates. Following this, the BBC Asian Network will be presenting The Big Asian Election Debate on 24th April, before it is then broadcast across BBC local radio stations and the BBC News Channel. The event aims to help the British Asian community who to decide for on polling day, May 7th. Party representatives will be present including Shahrar Ali (Green Party), Zuffar Haq (Liberal Democrats), Shabana Mahmood (Labour), Priti Patel (Conservative) and Tariq Mahmood (UKIP). On the first day of term (April 27th), The Guardian will be hosting its You talk, they listen discussion with a focus on immigration. Presented by Rick Edwards, the event will involve a panel debate including Guardian writers and other experts. The debate will take place in the Birmingham Business School, between 7pm and 8:30pm, and students can register for £5. In the final of the events to be put on by major media outlets, Sky News will be visiting the campus as part of its Stand up and be counted election tour on April 28th. On their visit to the University campus, students will be able to take part in live broadcasts to voice their opinion less than two weeks before the election. The news team will be set up by Old Joe, in Chancellor’s Court, between 10am and 5pm. Although two of these events will be held before the summer term begins, students are still able to get involved. To attend Newsbeat on April 21st, students should email newsbeat@bbc.co.uk to register their interest. Additionally, student societies at the University have been providing numerous opportunities to find out more about the parties. The Politics, Policy and Economics (PPE) hosted a series of question and answer sessions with local candidates, and the Debating Society held a Question Time for Selly Oak candidates. On April 28th, the University’s Politics society will be holding a panel debate with candidates contesting across the city. Voting for the General Election will open on May 7th, with votes being accepted between 7am and 10pm. To find out more, check out Redbrick’s General Election guide.